Microsoft’s “Digital Eatery”, a colourful café-showroom on the ground floor of its new tech centre in Berlin, has officially opened its doors. The space brings tech and culinary arts together and offers customers the chance to test out Microsoft gadgets while getting a taste of locally-sourced dishes from the kitchen. The café’s debut marks the completion of the first phase of Microsoft Berlin – a tech hub aimed at promoting dialogue between entrepreneurs, business partners, media and the wider community. It’s part of a wider global startup initiative called Microsoft Ventures, which offers a community evangelism programme, accelerator and seed fund. Currently, the top two floors of its building on Unter den Linden – reserved for the tech hub’s startup accelerator – are still under construction. The area, expected to open in November, will have a workspace for entrepreneurs, area for events and rooftop terrace. Gadgets, coffee and artists – what’s it like? In an attempt to offer a “modern” and “unique” consumer lounge, it seems Microsoft has tried to replicate aspects of Apple’s much-lauded retail strategy. A couple of steps into Microsoft’s new eatery and you’ll be sure to cross paths with a peppy red T-shirted customer rep offering a demo of the new Windows 8 OS. The space has smartphones and tablets sprinkled on nearly every available tabletop and shelf. 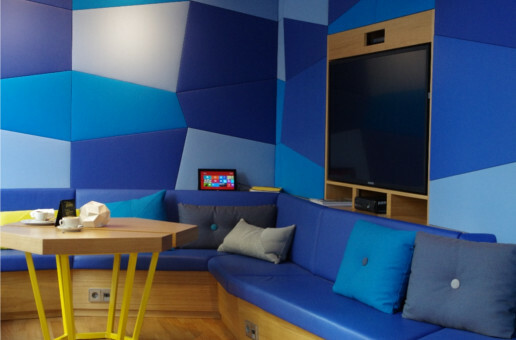 The showroom – which is divided into the four themes of “at home”, “en route”, “in the office” and “music lounge” – made us wonder what would come out of a chemistry experiment combining Microsoft gadgets, a not-so-sleek Apple store and an indie cafe. Sitting in the café in the early afternoon, we saw everyone from suits, tourists to students trickling in for a coffee and slice of cake. The restaurant, headed by Gernot Karger, is already in collaboration with a Cologne-based startup – MobiLab – from the Microsoft BizSpark programme, according to the Berliner Morgenpost. At the back of the space, we found a lively artist duo – Lecker & Heiss – working on a quirky mural of Berlin. Though Microsoft isn’t usually known for its design, it seems like the Digital Eatery is trying to change that with carefully placed titles such as The Berlin Design Guide, Freunde von Freunden Berlin and Wallpaper* on its bookshelves.